Welcome the green season by getting involved at Dodge's Rock the Barn event. 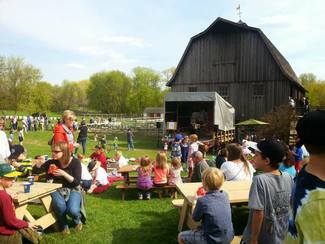 Enjoy an atmosphere of live music, baby farm animals, and fresh air. This farm festival generates excitement and community connection. Choose a role that best fits your style. Volunteers will get three complimentary meal tickets to be used for festival concessions. Preschool Ambassadors refer to your Dodge Nature Preschool team lead for your shift times. From there, take the boardwalk trail across the pond to the red education building to check-in. You must have a volunteer application on file with Dodge Nature Center or Preschool to volunteer. Dress for the weather so that you can comfortably carry out your volunteer assignment. To ensure the safety of our volunteers and guests- smoking, inappropriate behavior, and drinking will not be allowed before or during the event. An email with information will be sent to you a few days before the event. You must be on this online list to be notified in the email distribution. Check-in guests that still need to pay (money handling) and also by using our prepaid name list. This booth is a back entrance to the event located by the Main Office on Dodge's Main Property. One or more staff/board member must be at this station. Money handling. You will exchange tickets for cash. Guests can use tickets for food, bounce house, pony rides, bake sale. Two or more staff/board must be at this station. Facilitate and show kids how to participate in fun farm chores (monitor the cow milking, egg collection and carding wool). Need at least one staff at this station. Sweep hay back into hay jump and make sure kids are not climbing on nearby bales. Sell bake sale goods. Guests will pay for goods with tickets. Baked sale goods will be labeled with how many tickets each item is worth. Serve and/or prepare food to guests with a team of volunteers. Guests will pay for food with tickets. Number of tickets needed for each food item will be indicated. As alway, if you need to move me, that is okay. Take tickets/use app that will notify guests when it is their turn so they don't have to wait in line. Handing child a bowl with a carrot in it to give the pony on their turn. Line closes around 6:40 pm. Demonstration/engage with guests in these activities. Staff or teacher/naturalist volunteers only. Supervise and instruct pond dipping activity on boardwalk. Staff and teacher/naturalist volunteers only. Supervise guests meeting farm animals in the barn. Make sure no one is feeding them anything. Farm animal training required. Drive tractor hay wagon rides. Trained tractor volunteers only. 2 driving with rotation of 1 to break others. Breaker manage line. Check volunteers in. Badges, personal belongings room, location map, snack and water delivery to vol. Guests will give you said ## of tickets to jump in the bouncy house(s). Use a bell when a groups 5 minutes is up to rotate next group of kids. DNP parents will assist the Dodge volunteers at this station. Please ask your DNP team lead for details.